It is the breakthrough that physicists and chemists around the world have long anticipated and it will play a pivotal role in information technology in coming years. 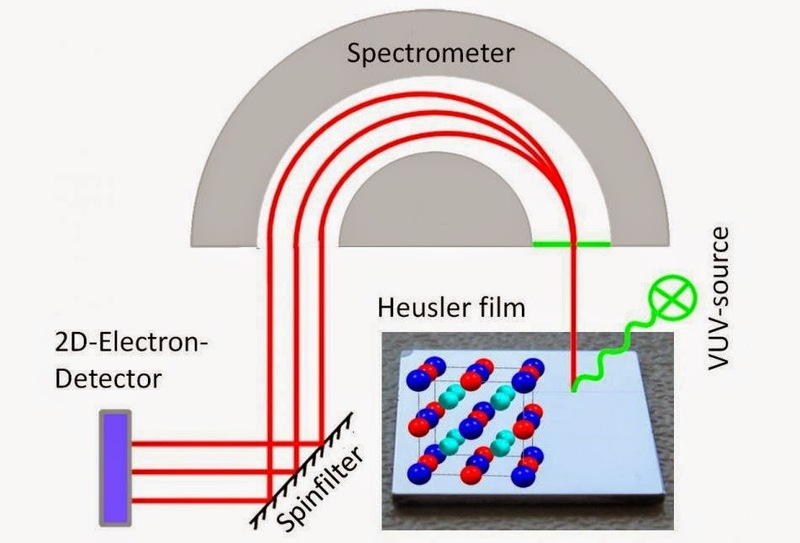 Researchers at Johannes Gutenberg University Mainz (JGU) have managed, for the first time, to directly observe the 100 percent spin polarization of a Heusler compound. Heusler alloys are composed of several metallic elements arranged in a lattice structure. They are among those materials that potentially can be used for ever smaller data storage components with ever greater storage capacity. However, doubts have been recently expressed as to whether Heusler materials are actually suitable for this purpose. The physicists at Mainz University have now demonstrated that the Heusler compound Co2MnSi has the necessary electronic properties. The project was conducted in collaboration with theoretical physicists and chemists at the Ludwig-Maximilians-Universität (LMU) München and the Max Planck Institute for Chemical Physics of Solids (MPI-CPfS) in Dresden. The results have recently been published in the online scientific journal Nature Communications. The findings provide the cornerstone for the future development of high-performance spintronic devices using Heusler materials. The potential applications include hard disk reader heads and non-volatile storage elements.